The accident happened in an area called Núpsvötn on Iceland's ring road between the town of Kirkjubæjarklaustur and area of Skaftafell, which is part of the Vatnajökull National Park beauty spot. Sveinn Kristjan Runarsson, Chief Superintendent of south Iceland Police said police have not yet been able to talk to the injured passengers - who are now in hospital in Iceland's capital Reykjavik - about what happened. Police said it is not thought the road was icy, but humidity could have made the bridge's surface - which is made of steel - slippery. Mr Erlingsson said the car "went through the railing and crashed down onto the bank". "It's kind of sandy, there's no rivers so it wasn't submerged in water. It just landed there on a sandy bottom and flipped over and was totally destroyed," he said. "The car was a total wreck. When I got there four people were out of the car, one of them deceased. Then there were three people trapped in the car. "The driver was alive and trapped more or less under the dashboard. We were trying to get the people out of the car and helping them, it was a very difficult situation." He said he spoke to some passengers who were "semi-conscious", adding: "I tried to talk a bit to the driver to calm him down." According to BBC correspondent Ben Ando, the 4x4 has been recovered and will be transported to the town of Selfoss where the bodies of two of the occupants will be taken out of the wrecked car. Iceland's national ring road, also known as Route 1, is popular among tourists. 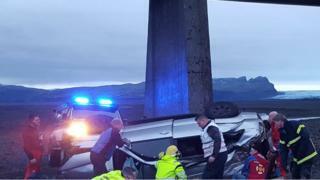 The accident happened near Skaftafell in the south-east, which is made up of mountains, glaciers, waterfalls and beaches.